The campaign of Sen. Bernie Sanders (I., Vt.) spent nearly $40,000 on luxury private jet travel during the third quarter, according to Federal Election Commission records. 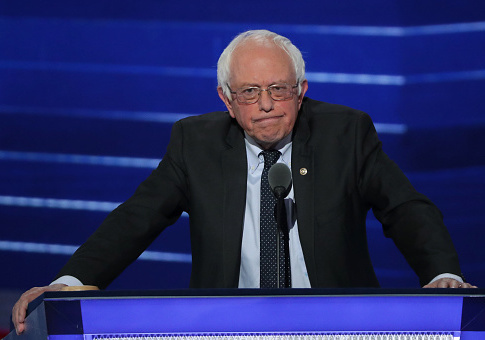 Sanders, who has said global warming is causing "devastating problems" and is in favor of a carbon tax, made the payments for the posh private travel arrangements from his Senate campaign committee, Friends of Bernie Sanders, to Apollo Jets, a New York-based private charter company that is "dedicated to providing a luxury flight experience based on superior safety and exceptional customer care," its website states. The campaign spent $37,567.53 to rent the private charters during the third quarter, which runs from the beginning of July to the end of September. Apollo Jets offers a number of charter options ranging from light jets, which seat six to eight passengers, to jumbo jets, the biggest option for flying privately, which feature "varied cabin configuration" that offers commercial seating for up to 500 people or "plush business class chairs for 50 or more" people. Sanders wrote an op-ed for the Huffington Post in 2014 that was also cross-posted on his Senate website pushing for a carbon tax. "The scientific community is clear: Global warming is real and it is caused by human activity. In terms of droughts, heat waves, floods, forest fires, disease, rising sea levels and extreme weather disturbances, global warming is already causing devastating problems," Sanders said. "The dirtier the fuel, the more expensive it will be," he later wrote. Sanders said he introduced the "most comprehensive climate change legislation" that included a tax on carbon during a Democratic primary debate in April 2016 as he was attacking Hillary Clinton on fossil fuels. One day after the debate, Sanders took a Delta 767 chartered flight to Rome, Italy, to address "immoral and unsustainable" wealth inequality at the Vatican conference, the Daily Mail reported last year. Fewer than 50 individuals were said to be on the plane that could seat between 211 and 261 people. A private internal memo left at a Los Angeles hotel from Sanders's presidential campaign last year additionally showed that the campaign had pondered asking the Democratic National Committee for a private, fully-staffed plane as part of negotiations with Clinton going into the Democratic convention, Buzzfeed reported. The Sanders presidential campaign allegedly wanted the private plane "for a series of fall rallies in battleground states," the memo said. Sanders's Senate campaign treasurer and his Washington, D.C. office did not return a request for comment or respond to inquiries on what trips were taken in relation to his committee's private jet expenditures. This entry was posted in Politics and tagged Bernie Sanders. Bookmark the permalink.